I can’t remember the last time we had it and I have been craving grilled chicken with BBQ sauce (not to be confused with BBQ chicken which I slow cook in a smoker). We had this regularly as a kid and I don’t know why it’s been so long since we’ve cooked it, so it was on tap for tonight. Following a trip to NOLA, I found that I really liked a muffaletta sandwich in large part due to the olive salad on it. Since I had also been wanting to make muffaletta pasta salad, we decided it would side well with the chicken. I found this good sounding recipe for both the olive and pasta salads from the Slow Roasted Italian and decided to give it a try. I made the olive salad about an hour before the pasta salad. Note: The Hot Joey’s Mild Giardiniera was picked up during our Chicago trip. 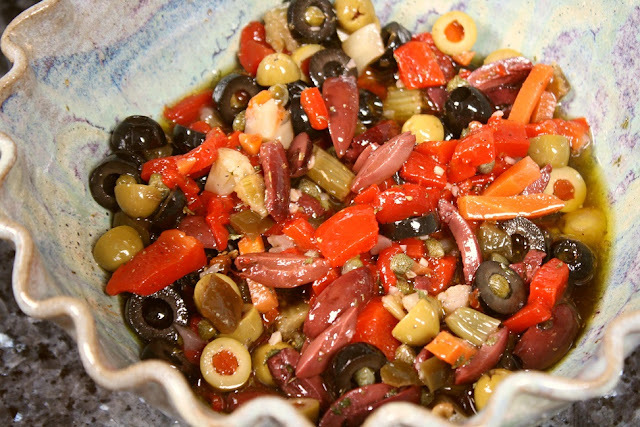 Prepare the olive salad: In a medium bowl combine vinegar, olive oil, garlic, oregano, parsley and black pepper. Whisk until well combined. Set aside. Cut up remaining ingredients according to ingredient list. Add remaining ingredients to bowl. Toss well until combined and coated. Refrigerate for 30 minutes (up to overnight). I thought the olive salad was outstanding. 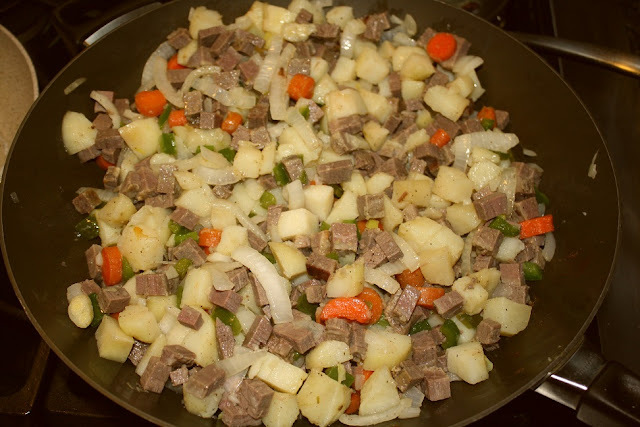 Well, this is my last post about corned beef hash at least this round. I decided to but the previous breakfast shots on here so we could compare them. 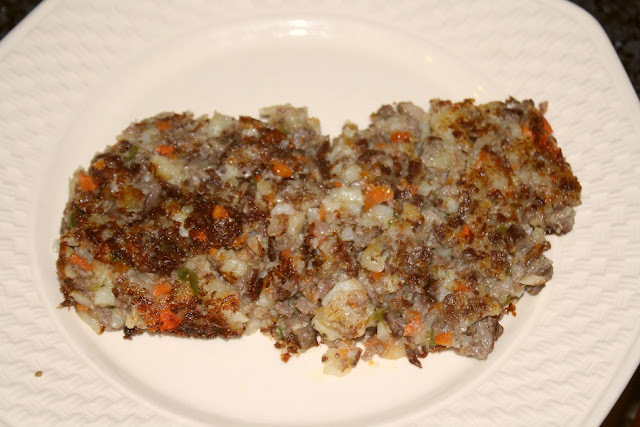 In my first post about the corned beef, I showed these shots of the hash. And then I posted about my Reuben-Like hash. Which leads me to today’s post. 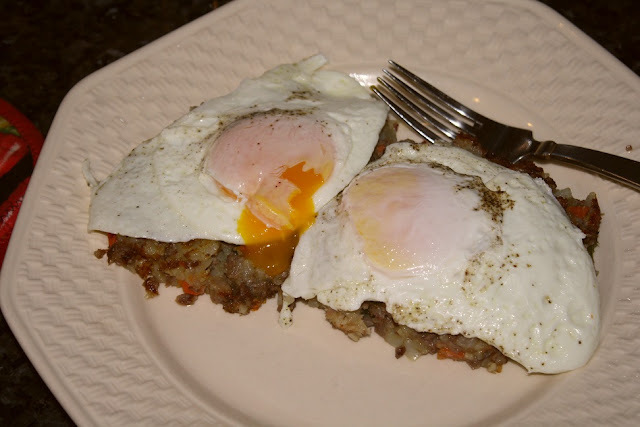 While I enjoyed the hash with larger pieces, I prefer the more traditional smaller pieces that can generate a crust when fried so I ran the entire batch of leftovers through the food processor to get this. 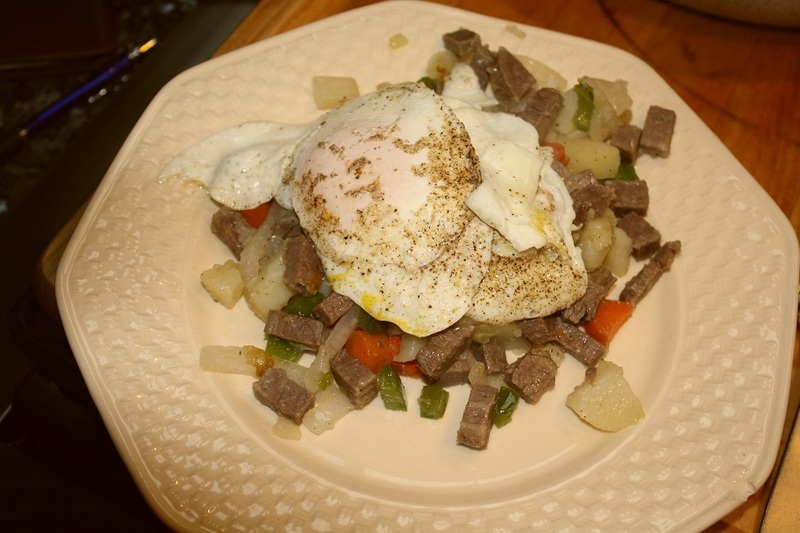 For my first meal, it was the traditional (at least for me) hash topped with eggs. Since I was not cooking on a flat top with one of those giant Waffle House spatulas, I had to half it for flipping. Then plated and topped with two over easy eggs. It was outstanding and I still had enough leftovers for a couple more meals which I packaged up and froze. I definitely achieved my original goal of making enough corned beef for plenty of leftovers. 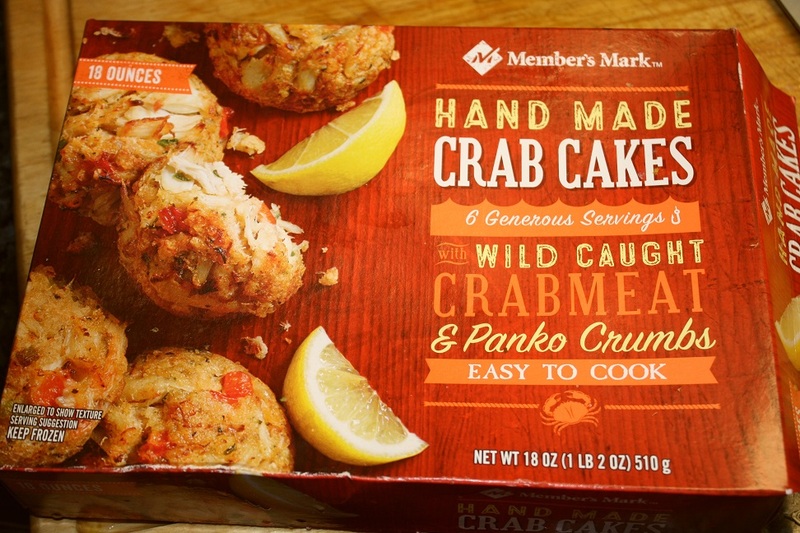 Bev had bought a box of Members Mark Frozen Crab Cakes from Sam’s Club and they were taking up space in our freezer plus our neighbors had given us some fresh picked asparagus and we had some red potatoes that needed to be cooked. This sounded like the ingredients of an decent easy meal and one like my mom might have made – no Sam’s back then, of course. First, a short rant about our food language and the liberties people continue to take with it – soon we won’t know what others are actually talking about. I call mine a Reuben-like sandwich because it contained some of the key ingredients (corned beef, Swiss cheese and kraut) but not the other two (Russian dressing and rye bread) as I used a white bread roll and 1000 Island Dressing. When I order a Reuben in a restaurant, I expect to get the ingredients in parenthesis and if not, it’s only a Reuben-like sandwich although it could be argued that 1000 Island Dressing is totally acceptable. 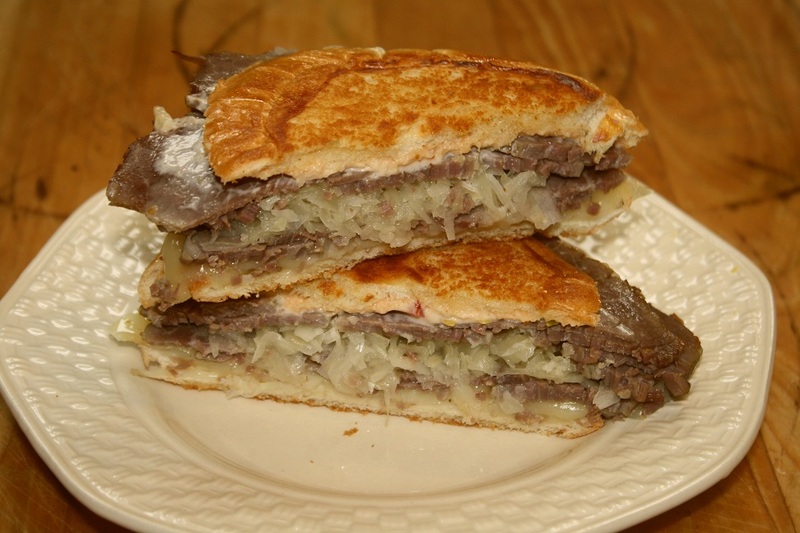 On Wikipedia they show several variants such as a Grouper Reuben, a Lobster Reuben, and a Walleye Reuben to name a few. I assume they just substitute a different meat for the corned beef but I wouldn’t know without asking. I would call it a Walleye sandwich with Swiss cheese, Russian Dressing, and kraut or slaw. Having said this, I know it will change no one’s behavior and restaurants will continue to offer Chicken Fried Chicken – chicken fried like fried chicken makes zero sense to me. Chicken Fried Steak (steak fried like fried chicken) makes perfect sense to me and is descriptive of what I will get. This may not have been Bev’s favorite corned beef, but it made for a delicious sandwich and I know it would have been super with a good rye bread. Then for breakfast thought I, if kraut, cheese, and 1000 Island dressing go well on a sandwich, why wouldn’t they work on the hash I had made, so I whipped this up for breakfast but I forgot the cheese. After the shot I mixed it all together and it was very good but perhaps not as good as just the hash with a couple of fried eggs, but then again what is better. For a few years I’ve read about some of you making limoncello but had never drank it so your posts provided little motivation. Then we went to a meeting of our wine group and a bottle was brought out to sample and Bev and I both loved it. Then we went to Napierville and sampled some supposed high-end stuff and decided we had to buy the $72 bottle and it was great. I then began remembering the previous blog posts and decided we would give it a try to make our own using two different recipes for comparison. The first was from Velva at Tomatoes On The Vine who actually harvested the Meyer Lemons from her own tree. I won’t recopy Velva’s recipe since I made it as she did but halved it. Check her site for the details and many shots. For St Paddy’s day, we had a store bought corned beef and Bev just loved it with the only problem being they are usually so small we don’t have enough leftovers for the things I really like – hash and Reubens. So I decided to take matters into my own hands and bought two nice, big, top choice whole briskets from Food City (except part of the deckle was removed) to turn into corned beef then smoke one into pastrami (more about this later). I trimmed them up and since the deckle was just a thin slab, I removed it to get rid of the big layer of fat between the deckle and the flat muscles. Here they are in the pan. I don’t know about you but I often read a recipe, think it sounds delicious and file it away for later, which seldom seems to come. 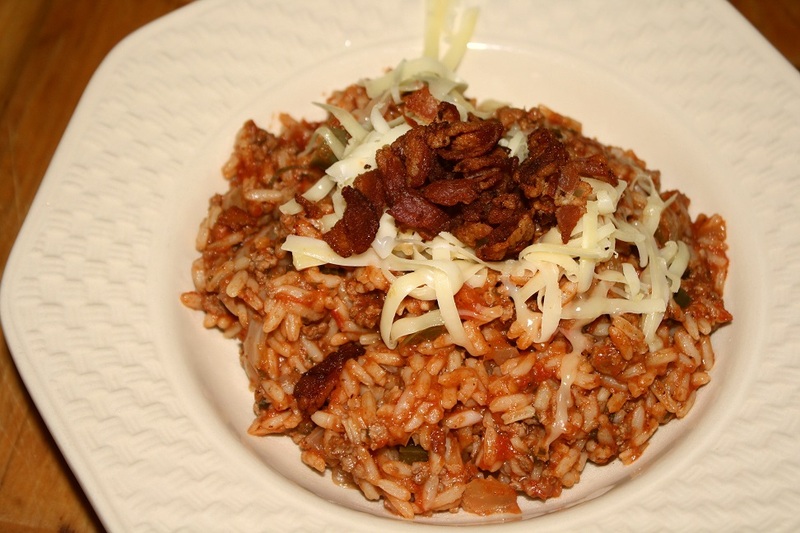 So when I saw Tricia’s post for Spanish Rice over on her Saving Room For Dessert blog and realized we had all the ingredients, I opted to make it that day. 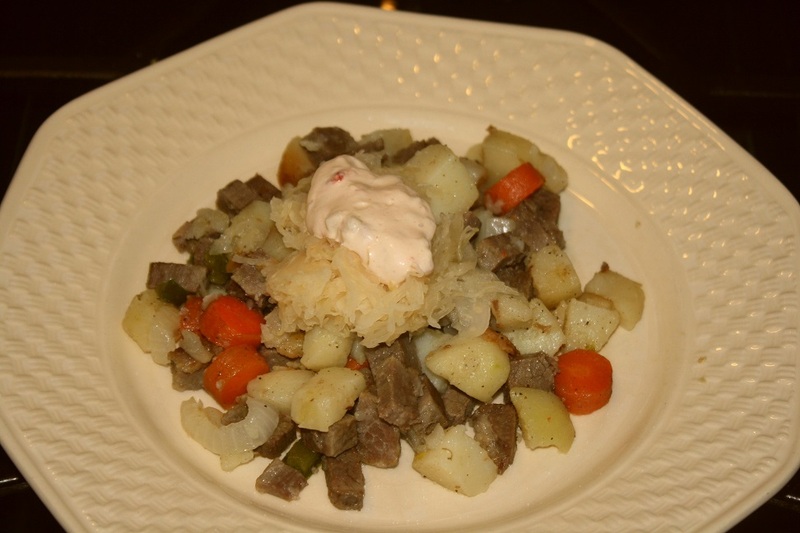 Check out her blog for the original recipe and some really good shots of her dish. 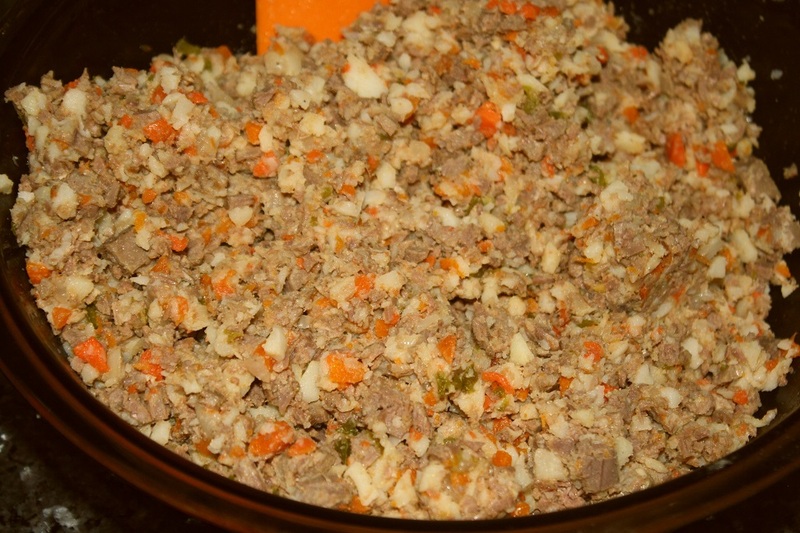 Rather than use it as a side dish, I decided to add some meat and call it the main dish, plus I changed the ingredients a little for our taste and changed the directions some as well to include the meat. 1. 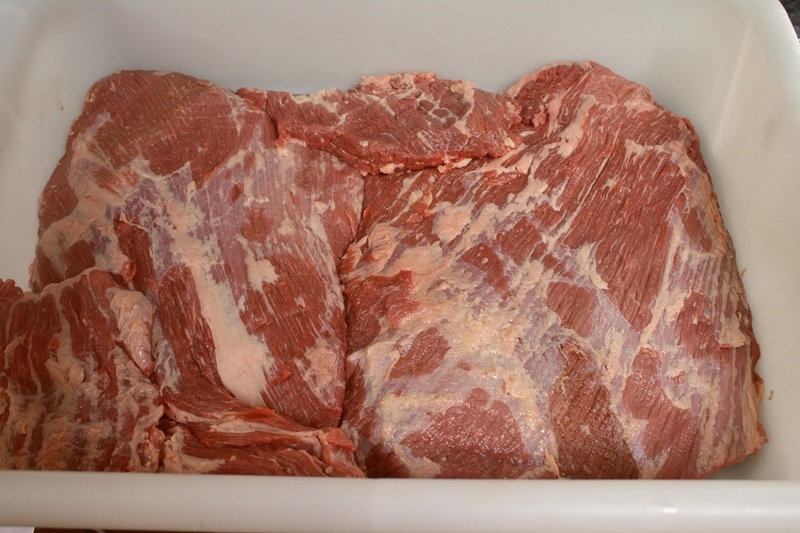 Chop bacon into about ½“ pieces and cook until crisp in a large skillet, remove and drain on paper towels. 3. Remove onion mixture from the pan and drain on paper towels. 4. 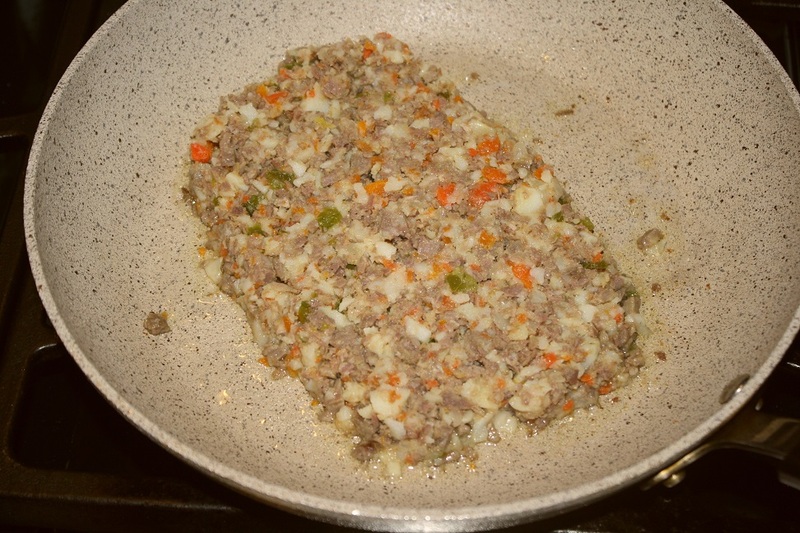 Add a little olive oil if needed and brown the meat, breaking into small pieces and S&P to taste. 5. Add the onion mixture, tomatoes and any canned juice, water, rice, Worcestershire sauce, chili powder, cumin, Sriracha. Reduce the heat to medium-low, cover and simmer for 30-40 minutes or until the rice is done. Most of the liquid should be absorbed but don't let it get dry. 6. Adjust seasonings and stir in the chopped parsley, and serve topped with crumbled bacon and shredded cheese is desired (I used white cheddar & hot pepper cheese on mine). We all thought it was very good and a definite keeper meal – maybe as good as Mom used to make. I also liked that it was a one pan meal. Thanks Tricia. And to wrap up our RV rally in the North Georgia Highlands, this covers our afternoon museum visit which followed our morning stop at Goats On The Roof. Some of you may remember the Foxfire books from the early 70’s that depicted life in the Southern Appalachians. 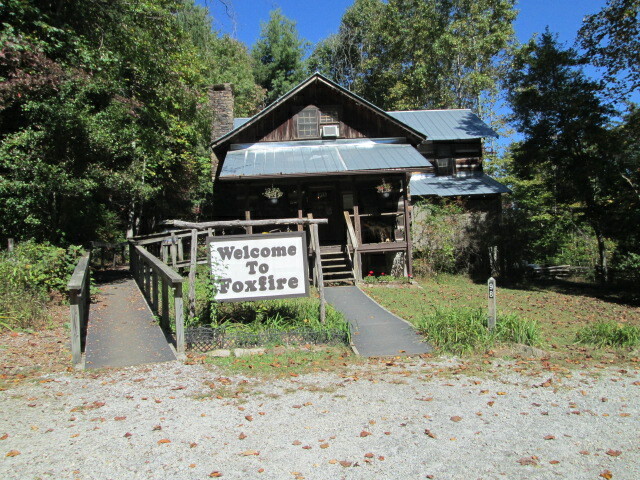 The “Foxfire Project” began when a teacher at the Rabun Gap Nacoochee School initiated a project to engage students in writing by publishing a magazine based on students' interviewing their relatives and local citizens about how lifestyles had changed over the course of their lives and dealt with traditions in the rural area. The magazine began in 1966 and is still being published. In 1972, the first of the twelve Foxfire books was published and in 1974, book royalties were used to purchase 106 acres for the museum. Students relocated donated buildings to the museum where they were reassembled in a village like setting and they built others, such as the chapel, from period materials (last shot). Unlike most museums that are in a building, this museum is the buildings located out in the woods. The tour begins at the welcome center then proceeds up the hill to the village area.